I recently whined about anxiously detailed mentioned how I reluctantly agreed to take senior photos of a friend's daughter. I say reluctantly because I am an amateur photographer at best, and am intimidated by the responsibility of shooting someone's portrait. I've kept my terror at bay by reminding myself that I have plenty of time to practice. We decided on a date in late July, and I figured I could experiment with light and angles and lenses, using my daughters as unwilling models. No pressure. I will be an expert in portraiture by the end of July! Then my frenemy called me last week and asked if I would do it the next day, because her daughter really wanted to get her pictures taken before she left on a 3-week missions trip to Peru. These people! Who do they think they are? Helping the needy, and stressing me out. I said sure, let's give it a try. If there's one thing you should know about me, it's that I can hyperfocus. It's kind of weird and freaky. My sister first noticed this annoying ability of mine when she would beg me to go outside and play. Only I'd be so immersed in a book that I literally could not hear her. I wasn't behaving willfully or trying to be a brat; I was just concentrating 100% on what I was reading. She'd finally give up and leave. Fifteen minutes later, a tiny echo of her voice would niggle its way into my mind, and I'd look up and ask the empty room, "What? Did someone ask me something? Hello?" At the risk of using understatement, I've been hyperfocusing on this photographic assignment. We took a range of pictures in several locations. Any extra time I've had has not been spent blogging (or cleaning house), but transferring RAW images from my camera into jpeg format on my computer. What? It's the Fourth of July? Hello? Ha! We are simultaneously blogging on two coasts! I posted my sewing piece and lo-and-behold! Kim FINALLY posts something only five minutes prior!! FTR, I have seen many a 'professional' portrait that wasn't as nice as the one you posted. Don't be too hard on yourself. It turned out exquisitely. I hope they have the good sense and manners to be thrilled! Wow that is truly a gorgeous portrait, you do have skills in the photographic area, so believe in yourself more.. this is lovely and I'm sure your friends agreed!!! Well done.. we are still waiting for summer here in UK.. we will be in autumn soon!"! The picture looks beautiful. 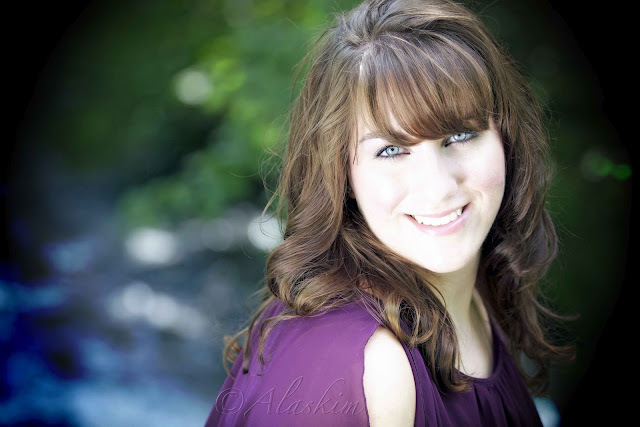 Many bloggers talk about these senior portraits. It's not something we do in our neck of the woods. You did great job! She must have been thrilled!